can dramatically increase the productivity and performance of your company Successful businesses give over as much time and resource to group training as to any other aspect of their skills enhancement programmes. Hospitality can be arranged by us to suit the occasion. Close by are hotels and restaurants of varying standard and price - there is sure to be something to suit your budget and the participants. Refreshments can be provided "in the field" as required. Paul Manning is an accomplished public speaker. You may wish to consider including an interesting pre-dinner presentation or a more light hearted after dinner speech in your programme. 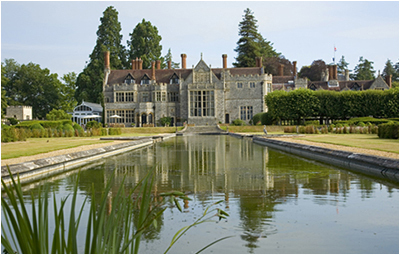 Below is a photograph of Rhinefield House, one of our "A -List" properties in the New Forest, very popular with our Corporate Clients. Having discussed your requirements we will prepare a detailed quotation. Please call us to discuss or set out your preferences in an email or letter for a quick response. Recent corporate clients include, Mercede Benz, Smith Gore, ION Consulting, Tibra, IPD and HSBC at venues Rhinefield House, Wherwell Estate and Avington House.